Oh, Casserole! Oh, Casserole! How I love me some casserole! Especially when Thanksgiving is right around the corner. Because you know what that means? Leftovers. For days. Of everything. Which makes me ridiculously giddy. Turkey, people! And mashed potatoes! Oh, and maybe some lovely, flakey cheesecake, too! Seriously. What more could you ask for? So in preparation of THREE family Thanksgiving gatherings (yes, THREE), I went hunting through every Pinterest recipe ever pinned. Obsessive? Me? Ha! Not at all! *wink* Since I’m still very much a beginner with my Dinner Dishes (& rarely have more than a half hour or so to play around in my kitchen with my Toddler running underfoot), I tend to look for the easiest, simplest recipe ideas I can find. In hopes that I won’t royally mess it up. Which, I’m not afraid to admit still happens (occasionally), and eventually becomes the perfect snack for my Chloe Girl instead. I do love learning new cooking techniques from these messy, messy mistakes, though, so it’s not always a total disaster. Looking on the bright side, right? Anyhow, you ready for Thanksgiving? Here’s the perfect way to get started! Preheat your oven to 350 degress. Butter or spray a 9inch casserole dish. In a large mixing bowl, handheld or by a stand mixer, beat the cream cheese for a few minutes. Beat in each egg, one at a time, followed by the garlic powder, salt, pepper and sugar. Mix until throughly incorporated. 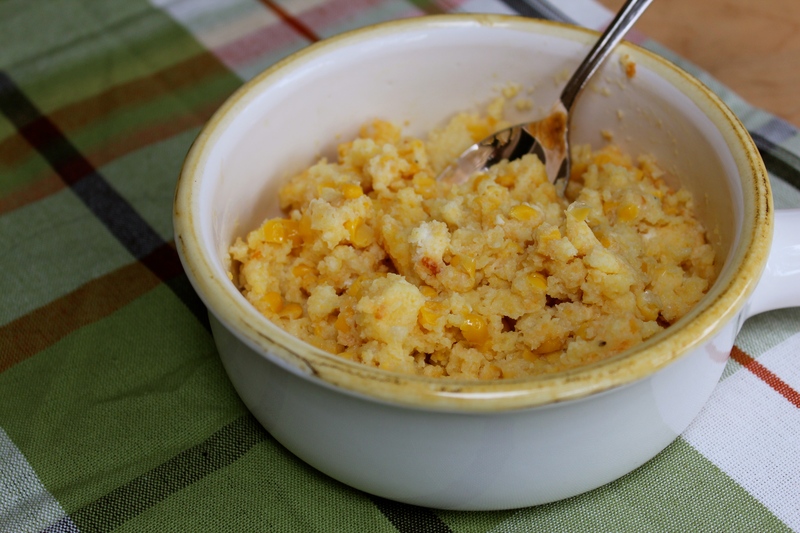 Blend in the cornbread mix, cheddar cheese, butter and milk, until well mixed. Stir in all 3 cans of corn by hand. Pop the casserole into the oven and bake, uncovered, for 55-60 minutes. The casserole will be fully baked once the edges brown slightly and the surface of the casserole is gently firm to the touch. Let cool for a few minutes before serving. From my Family to yours, we’d like to wish you all a very Happy Thanksgiving! Happiness Project #43: Peppermint Surprise Cookies! Huzzah! November is here and so is a rather beautiful Fall! With gold and green leaves, crisp nights and stunning moons! An absolute favorite season of mine! Despite the sad fact that I’m no longer able to withstand wearing some of my favorite fuzzy sweaters. Menopause. No fun. But even though my Fall wardrobe is suffering, my Daughter’s however is ridiculously cute! With purple birds and striped leggings and adorable animal beanies. Seriously people, if adults were able to look just as cute in clothing as Toddlers, I’m positive that this sometimes dreary world of ours would be a much merrier, happier place. But since this is not always the case, what’s the next best thing to a guaranteed happy day? Cookies. Bright, crunchy, merry cookies! With the taste of fresh peppermint bursting upon one’s tongue. And chocolate. Because, well, chocolate. So in light of what I’m now officially dubbing “Cookie Season,” my sister found this fantastic recipe on Pinterest that was a MUST BAKE NOW kitchen adventure. In which my 20mo Baby Girl gleefully helped us with. And by “help,” I really mean by indulging in. A little too much, in this Mama’s opinion. And yes, I blame her Auntie. Anyhow, after catching both my sister and Baby Girl ecstatically stealing far too much of this cookie dough, this lovely, crunchy, fragrant cookie is what we came up with. Just like the original recipe, though with a few minor adaptations. Ready for some guaranteed holiday cheer? Here you have it! *Optional: Can’t have chocolate? Instead of adding in Oreo cookies and M&M’s, add in 1 cup of pecan chips instead! Or drizzle with a vanilla frosting glaze. Therefore, you’ll still get that extra crunch and added bit of sweetness. Firstly, preheat the oven to 350F. Line up two baking sheets with Silpat mats or parchment paper. In a stand mixer (or easily by hand held), combine the cake mix, melted butter, salt, egg and both extracts. Beat at medium speed until a soft dough forms. Add in the cream cheese and mix until gently combined. 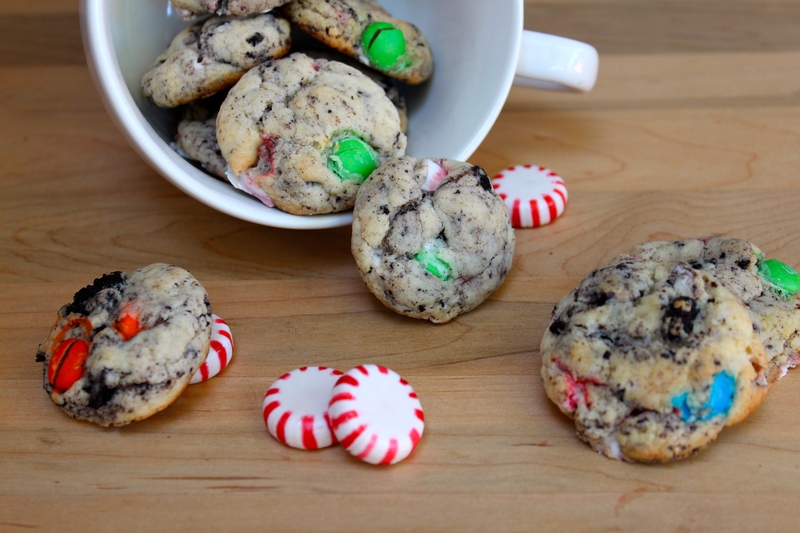 With a wooden spoon, gently stir in the crushed Oreo’s, crushed Peppermint candies and M&M’s. Pop your dough into the fridge for 30-40 minutes to help the texture stiffen up a bit before rolling. Once you’re happy with the dough’s stiffness, firmly roll the dough into 1-1/2 inch balls and place them onto your lined cookie sheets. Bake for 10-11 minutes until the cookie bottoms are slightly browned. Once removed from the oven, you’ll notice that the crushed peppermint candies have liquified and oozed out a bit from each of the cookies. With the edge of a metal spatula, gently scrape the edges back into a circular (cookie) shape. Well, unless you like a messy (but still pretty) cookie. Transfer your soft cookies onto a wire rack & let cool for a few minutes before either serving or storing (covered). Ridiculously easy. And very festive. Oh, and let’s not forget, super Toddler friendly. Since my Daughter ended up sneaking in a good 4 or 5 of these little munchies while I wasn’t looking. Which, I do not always recommend for a 20mo Toddler, by the way. Unless, of course, you’re totally okay with watching your little one go through a rather hysterical sugar high.